"Oh, How I Knead You"
As the Holidays approach, why not consider buying the ultimate "gift that keeps on giving"? A gift certificate for a professional massage is something anyone on your gift list will not just appreciate, but revel in-and not only will s/he thank you for a long time to come, but you will contribute to the "anti-consumerism" movement and boost your local economy at the same time. That's a lot of bang for your buck! But don't take my word for it. Go out and get a massage yourself before the stress hits; you'll get through the season much more comfortably and know first-hand just what a great gift you'll be giving. 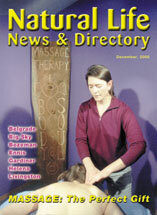 Our local area is becoming a mecca for massage therapists and other alternative health practitioners. We've got just about everything you can imagine in SW Montana: Swedish massage, rolfing, lymphatic drainage, myofascial release, trigger point therapy, oriental bodywork, movement therapies, energetic techniques such as Reiki, Polarity and CranioSacral therapy-we've even got animal massage and Watsu! "Wats-it-all" mean? If you've never had bodywork or experienced a massage, you may feel overwhelmed with all the choices. And, though some of the above may seem "new-age," massage has a long and respected history. From the Greek masso, which means, "I knead," massage is found in Chinese literature as far back as 3000 B.C. and was used by the Greeks themselves, as well as by the Romans. Hippocrates stated: "The physician must be experienced in many things, but assuredly also in anatripais-the art of rubbing up. (The profession has considered adopting the term "anatriptic" to include the entire spectrum of skillful, sensitive touch and movement therapies). Rubbing can bind a joint that is too loose and loosen a joint that is too rigid. Indeed, the benefits of massage and other forms of bodywork are numerous. Athletes know that a good sports massage either pre or post event can protect their muscles while increasing the circulation, nerve supply and cell activity, leaving them more supple and pliant. Recovery time is shortened. Though no longer practiced by physicians, massage is still in the hands of capable professionals. Today's massage therapist is educated in anatomy, physiology, pathology, movement, ethics, psychology and a host of "modalities," or techniques. With the opening of Health Works Institute, a full curriculum massage school, Bozeman now offers continuing education for established practitioners and a career development program for those aspiring to join them. As founder and Director Ruth Marion says, "It is going to be much easier to find consistency in getting a good massage from a well-trained therapist." So, now that you're convinced, there are a number of criteria you can use to decide whom to call for an appointment. First, consider limiting your search to those who are Nationally Certified or who hold a license or certification in a specific modality. Since licensing is not mandatory in Montana-as it is in some other states-national certification indicates a willingness to meet minimum educational, ethical and professional knowledge standards. If someone is not certified, ask whether they belong to any professional organizations. Membership in the AMTA (American Massage Therapy Association) or another organization for bodywork, movement or "somatic" educators also indicates a dedication to professional standards. Second, consider your personal circumstances and preferences. Do you like a gentle, soothing touch, or crave the release that deeper, more intense work can bring? For the former, choose a basic, swedish style massage or any of the "energetic" models; for the latter, consider myofascial release, neuromuscular therapy, rolfing, shiatsu or acupressure. If you have a specific condition, that may assist you in making your choice. Your physician may be familiar enough with manual therapies to recommend a specific modality. And certainly, ask around. Don't, however, assume that you will have the same experience as the person who referred you. One of the interesting things about massage therapy is that no two practitioners will apply even the same technique the same way and, since there is a unique dynamic between each client and therapist, your experience will reflect that unique dynamic. Try a number of different modalities and therapists until you find the technique and the touch that send you out the door feeling phenomenal. If you're just too shy to try a full body massage right off the bat, or if time is a serious consideration, why not consider a chair massage? Often, the practitioner can come to you, there is no disrobing necessary and it can be 15 or 30 minutes of magic that will leave you feeling relaxed and refreshed. Chair massage is sometimes offered by larger employment firms as part of their employee benefits program. And, it works both ways; relaxed, happy employees are more productive, efficient employees! Expect to pay between $35.00 - $60.00 per hour for a professional massage. In some instances, massage is covered by insurance. Check with your carrier-a physician's or another primary caregiver's prescription can often be the deciding factor on whether or not a massage therapist's fees are covered. There are a number of excellent resource books on bodywork: Thomas Clarire's Bodywork ­ What Type of Massage To Get and How To Make the Most of It describes itself as "a complete guide to the experience and benefits of receiving every different kind of massage and bodywork therapy," whereas Mirka Knaster's Discovering the Body's Wisdom discusses the alienation many of us feel regarding our bodies, how to befriend and find the wisdom it holds, and how to choose a "bodyway" and interact with a practitioner. Each section of this book examines the foundation of a whole group of practices and how they approach the body. Both of these books are easy and enjoyable to read and give examples of actual sessions. Once you've experienced massage, you're likely to get hooked-it can become addictive! But not only is it a wonderful gift, it's a great investment. Regular massage can help keep you humming and healthy. It's excellent medicine for both you and your pets. Seriously, animals respond to skilled, loving touch just as we "two-leggeds" do. To join the growing number of people nationwide who are enjoying the benefits of massage, make an appointment today or, at the very least, make it one of your New Year's Resolutions, and give a gift certificate to a friend or loved one. Happy Holidays!